Tea from China - China Restaurant ZEN in Adliswil, near Zurich. Famous for Peking duck and authentic Hong Kong style dim sum with organic ingredient and vegetarian menus. China is the country of origin of the tea bush. 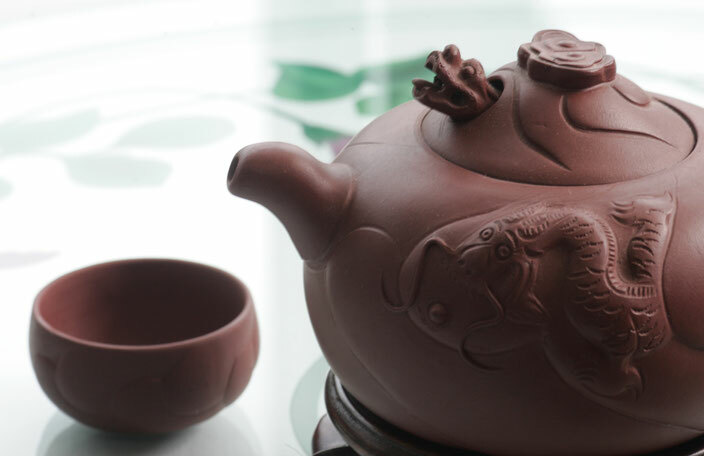 According to legend, emperor Cheng-Nung discovered tea while drinking brewed water in his garden in the year 2737 B.C. A few leaves from a nearby bush fell into his bowl, and the water was coloured golden-yellow and began to smell delicious. He took a sip of the beverage and found that he liked it. These effects result from the principal components caffeine (theine) and tanning agents (tannin). Theine intensifies the brain’s blood circulation, has a stimulatory effect on the central nervous system, and boosts the powers of concentration, reaction and association. Tannin has an antibacterial and soothing effect. It helps in cases of indigestion and gastro-intestinal disorder, amongst others. Moreover, tea contains essential oils as well as important minerals, fluorine and other trace elements.